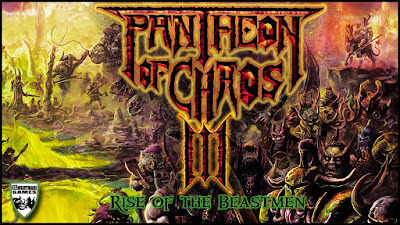 Just wanted to do a quick post shouting out a Kickstarter I'm backing, Knightmare Games' "Pantheon of Chaos 3: Rise of the Beastmen" to produce more Oldhammer-appropriate beastmen and Chaos Thug-types for their on-going "Pantheon of Chaos" line. It's a week out from completion and the next stretch-goal is a free bonus Chaos Warrior for everyone backing at the 50-euro mark or higher. I recently ordered a handful of Knightmare's Chaos figures to get a sense of them in terms of size and casting, and I love them. Very crisp casts, unique and imaginative sculpts. The figures I received have a mix of tabbed and untabbed feet, and because consumers have a variety of needs regarding bases, so Diego at Knightmare does not include bases with his figures. I've got some on order, the four-armed Chaos Raider Champion is actually too big for any of the slotta-bases I had handy. 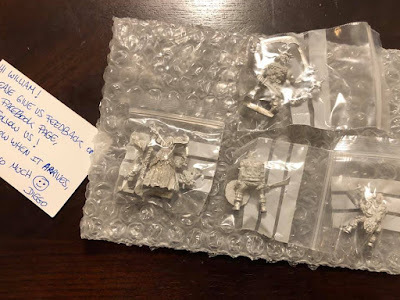 I'm so taken with these, and with the new sculpts from the Kickstarter, that I've made the decision to replace all the Age of Sigmar-era plastic figures in my Dragon Rampant Chaos warband with metal figures, primarily from Knightmare, with the goal of having every figure in the warband be a unique sculpt. 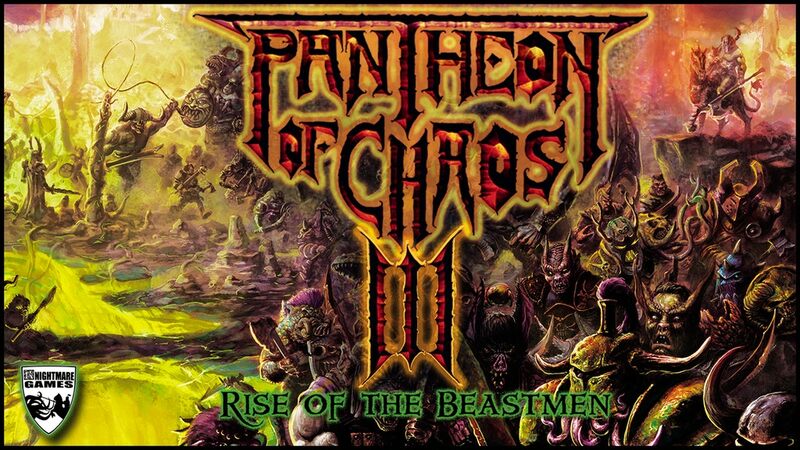 With the breadth of Knightmare's expanding "Pantheon of Chaos" line, I think it's going to be easily done. I like a little chaos, looking for 15mm though but nice is still damn nice!